AN EXCITING SCENE OF TWO STEAMBOATS RACING DOWN THE MISSISSIPPI RIVER SIX YEARS AFTER THE CONCLUSION OF THE CIVIL WAR The Mississippi riverboat was second only to the cowboy as the quintessential American product. Indeed, Gulf Coast steamboats achieved such international popularity that wagers were placed as far away as Berlin and Vienna on the outcomes of the famous steamboat races down the Mississippi. Besides their profound economic and technological importance, steamboats also figured as important thematic elements in nineteenth-century European and American art, literature, speech and song. For example, within the works of Joseph Conrad, Charles Dickens, Edna Ferber, Jack London, Herman Melville, Eugene O’Neill, Robert Louis Stevenson and, of course, Mark Twain, steamers served variously as symbols for the contemporary pride and progress in technology, as metaphors for the conflict between man and nature, and as elements of plot and setting. 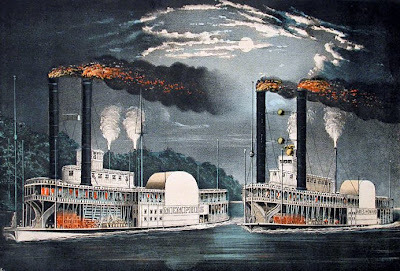 This action-packed chromolithograph depicts two paddle steamers, the Lincoln and Davies, racing down the Mississippi River at night. Both of the steamers charge through the Mississippi’s calm rivers, their hulls crashing through the waves and smokestacks emitting fiery exhausts. Both of the ornate boats are typical of their time periods, as both possess flat-bottomed hulls, 2 side-paddle wheels and are propelled by a single high pressure engine. Passengers are pictured congregating on the decks of each of the boats, eagerly anticipating the outcome of the fiercely fought race. The entire enthralling scene unfolds under a glowing full moon which is seen nestled within an electric blue night sky. This work wonderfully encapsulates the period of the steamboat’s transportation and cultural dominance in the United States, a position soon to be usurped by the mighty railroads. Getting old is not all the fun and games you think it is chuckle chuckle. What a fancy hat. Washington, D.C., circa 1915. "Miss Elsie Walker." 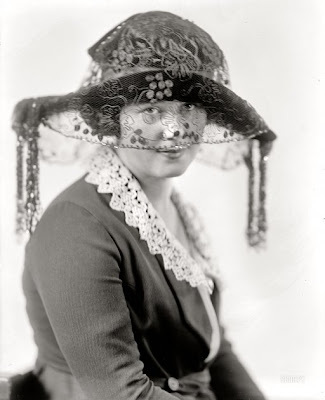 Whose fetching features are only enhanced by her chic chapeau. Harris & Ewing. A familiar scene in every town, on my street just this week. 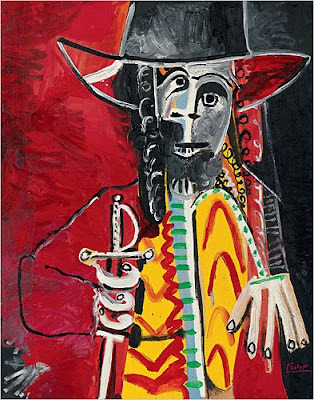 Picasso's 1969 swordsman copped 11.5 million at Sotheby's. I suppose if you had this on your high priced homes wall, it would be readily identifiable as a Picasso, or perhaps a preschooler with a new box of crayons. I love this movie. I've watched it several times, and have always gotten a kick out of the actual scene from the movie, questioning Ilsa's ability to understand what was going on around her, but knowing she would understand it better sometime in the future, after she pondered it for a while. It almost seems humorous today, but in the forties it pretty much depicted it the way it was. Sunday's best from the talk shows. Now here is some good news. We can all pretend that we knew it all along and this extra weight we've put on was on purpose. 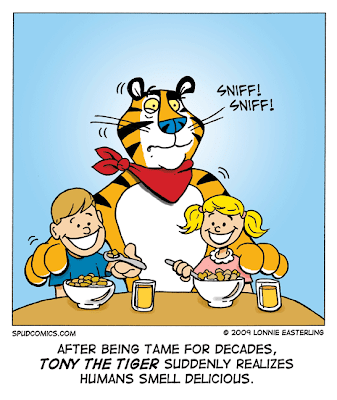 After seeing this cartoon from spudcomics.com, I was immediately reminded of the Las Vegas magicians Siegfried and Roy, when Roy's performing tiger thought the same thing about Roy. I love my TV remote, is it going away? Well, sorta. The seemingly unflappable Obama dealing with Iran. What will the world be like in the next hundred years. 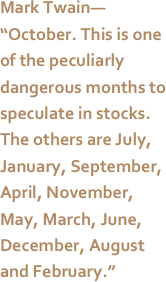 George Friedman wrote the book trying to look into the crystal ball and forecast what will happen. Take a look. From CSPAN. I live in Ohio, but that doesn't make me a farmer. We have dug up many areas in our backyard planting flower gardens, real gardens with vegetables and those kinds of things, but we're getting a little older and a little digging goes a long way. So we have cut back on our creative digs and are putting them back into grass. Decision made we headed for the garden store to pick up some grass seed and straw to cover the seed and keep it moist. We bought an ample amount of seed so it will be covered completely, and some straw to cover the seed. We, being the crack gardeners we are bought twice the amount of straw that we needed. So here is what we found on the internet that might use up our larger than needed purchase of the stuff. If you've never read Andy Borowitz, you really should. He is very funny and clever. This one about the U.S. beating Korea up with adjectives is great. More from Andy Borowitz here. I think it happens to all of us, forgetfulness that is. Just yesterday during conversation #three million two that my best friend and I were discussing that names seem to go first. If we live a full life then it will probably happen to all of us. I know there is nothing to be done for it, but I worry anyway. I have memories neatly squirreled away that I don't wish to lose, why? I seem to have forgotten. This young lady surely has a future in some athletic endeavor, or maybe in dance. Good luck to her. The seven best moments from Sunday's talk shows. Here's my two cents worth. I think David Letterman and others in his profession should put a governor on what comes out of their mouths. I am not a Sarah Palin fan, in fact I think the GOP could do a lot better, but Palins children are not fair game in my opinion for any comedians funny fodder. Palin and spouse are fair game, they volunteered to put themselves out there and must be able to put up with comedians like Letterman, but not the kids. They should be off limits completely. To paraphrase a favorite juvenile battle cry, 'I didn't ask to be born', they also didn't ask to be made fun of on television or anywhere else. Leave them alone. An integral part of the new heath care system, and cost effective also. 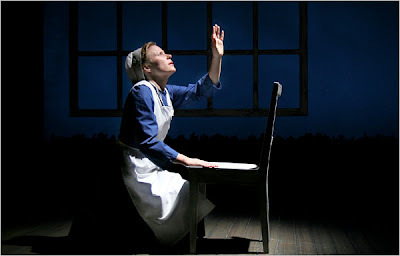 The actress above is Jessica Dickey acting in her play THE AMISH PROJECT. I live near the biggest Amish conclave (if that's the right word) in the U.S. in Holmes county Ohio. We, living in this close proximity, have become use to their dress, their buggy's, their ways, their wish to avoid having their pictures taken. 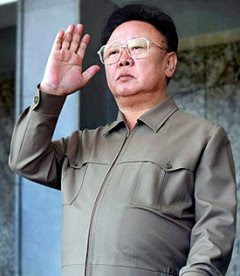 What I admire above all else is their belief's and non-violence. They live them everyday of their lives. The forgiveness shown to the killer who killed the Amish children in the school was extraordinary. Their belief in non-violence befuddles most of us, and runs counter to how most of us would react in such a moment. The scene in the movie WITNESS of the town rowdies abusing a man who in all probability could physically walk all over them is a dramatic example of their belief being pure and deep to endure such incidents and turn around and forgive the perpetrator. The Amish in all their peculiarity's are what the original settlers asked for and received, a chance to live their lives and beliefs and contribute to the land they chose. There was once a radio show titled FIVE MINUTE MYSTERIES. Try one. Is Article 9 too good, and too unrealistic to last? I don’t think there is such a thing as a good war even though Studs Terkel might disagree with me. I believe there are some wars that are necessary. World War II would fall into that category. For all those non-history students, that was the war that featured the United States as the good guys and Japan as one of the bad guys. After they were on the receiving end of two atomic bombs with more in the offing, Japan decided wisely to save the lives of perhaps a million more soldiers and civilians, and surrendered. They also wisely included later in their new constitution, article 9, which forbade maintaining military forces ever again. Article 9 has remained in the constitution for sixty years, and the Japanese people have been happy with the decision they made. But sadly it seems, article 9 has run head long into the 21st century and they may reluctantly have to drop what may turn out to have been a Japanese version of Camelot, a place where it doesn’t rain until after sundown and by eight a.m. the sunlight must appear, a fairy tale. As it was in Camelot outside forces disrupted what was a wise, and beautiful moment, it may also be coming to Japan. The changing and ever more dangerous world has come to Japan’s door and questions their non-participation in helping police the more belligerent members of the world community. It’s sad because if it is not changed by 2010, you can rest assured that more efforts will follow until they, which ironically includes the U.S., are successful and article 9 will fall into legend and become a tale the Japanese will tell their grandchildren. A tale of what some will remember as a dream that could not last. Article 9 of the Japanese Constitution not only forbids the use of force as a means to settling international disputes but also forbids Japan from maintaining an army, navy or air force. Therefore, in strictly legal terms, the Self Defense Forces are not land, sea or air forces, but are extensions of the national police force. This has had broad implications for foreign, security and defense policy. The ruling Liberal Democratic Party (LDP) government has interpreted Article 9 as renouncing the use of warfare in international disputes but not the internal use of force for the purpose of maintaining law and order. The main opposition party, the Democratic Party of Japan (DPJ) tends to concur with the government's interpretation. At the same time, both parties have advocated the revision of Article 9 by adding an extra clause explicitly authorizing the use of force for the purpose of self-defense against aggression directed against the Japanese nation. The now-defunct Japan Socialist Party (JSP), on the other hand, had considered the Japan Self-Defense Forces (JSDF) as unconstitutional and advocated the full implementation of Article 9 through the demilitarization of Japan. When the party joined with the LDP to form a coalition government, it reversed its position and recognized the JSDF as a structure that was constitutional. The Japanese Communist Party (JCP) considers the JSDF unconstitutional and has called for reorganization of Japanese defense policy to feature an armed militia. Since the late-1990s, Article 9 has been the central feature of a dispute over the ability of Japan to undertake multilateral military commitments overseas. During the late 1980s, increases in government appropriations for the JSDF averaged more than 5 percent per year. By 1990 Japan was ranked third, behind the then-Soviet Union and the United States, in total defense expenditures, and the United States urged Japan to assume a larger share of the burden of defense of the western Pacific. Given these circumstances, some have viewed Article 9 as increasingly irrelevant. It has remained, however, an important brake on the growth of Japan's military capabilities. Despite the fading of bitter wartime memories, the general public, according to opinion polls, continued to show strong support for this constitutional provision. The majority of Japanese citizens approve the spirit of Article 9 and consider it personally important. But since the 1990s, there has been a shift away from a stance that would tolerate no alteration of the article to allowing a revision that would resolve the discord between the JSDF and Article 9. Additionally, quite a few citizens consider that Japan should allow itself to commit the Self-Defense Forces to collective defense efforts, like those agreed to on the UN Security Council in the Gulf War, for instance. Prime Minister Shinzo Abe marked the 60th anniversary of the Japanese Constitution in 2007 by calling for a bold review of the document to allow the country to take a larger role in global security and foster a revival of national pride. Well to be quite honest about it, I don't, or at least I travel very little. It's quite a conundrum actually. When I was young and inquisitive about other countries and cultures I really could not afford to scratch the itch, and now when I could afford to indulge myself in a little world exploration I wish not to take to the road for various physical reasons. No, I'm healthy enough, just getting older, and I dislike living out of suitcases and being away from the comfort and habits I have acquired in my retirement years. But some mornings I awake and for various reasons my mind returns to those days when I was excited about seeing new countries, exotic cities and journey among people speaking other languages than mine. It was fun, now it would just be irritating that they spoke in a language other than English. Luckily I am in the minority and most people I think, still like to look around the next curve in the road or sample strange foods, and live for a while in the other man's shoes. This slideshow invites 23 people to explain why they like to travel. 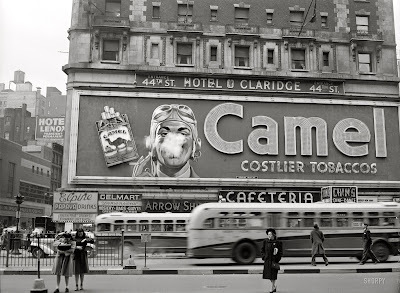 From Shorpy comes this billboard of the man blowing smoke rings in 1943. Times do change and smoking became de-classe and out of fashion. I never thought that would happen. We all smoked as I was growing up. I smoked for many years and quit before my wife had our last child. That was approx. 32 years ago. I am convinced that stopping has improved my health as the years have piled up. If you have not discovered Shorpy yet, you really should. Book recommendation. AMERICAN MADE by Nick Taylor. A video book review. Will we come to this, this time around? 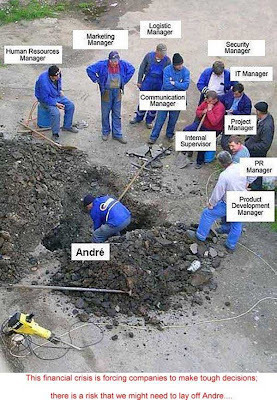 I don't believe so, but our infrastructure could certainly be put on the to-do list and dropped into the job jar. That a large percentage of the projects created by the WPA still stand sixty years later, and are still being used are a statement of it's usefulness. From onelinerz.net comes this one liner: I asked God for a bike, but I know God doesn't work that way. So I stole a bike and asked for forgiveness. 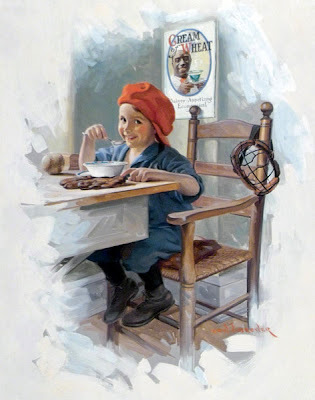 Painting by Edward V. Brewer 1883-1971, who painted a long series for the Cream of Wheat company advertisments. I am not a beer drinker. I've tried different brands through the years, but none has done a thing for me. That is until recently. The wife and I were dining out at the Outback and I felt like trying once again to find a beer that I can say I like. Well I think I have found one I truly like. Now this is all based on a one glass of beer test. Not exactly a scientifically in the lab kind of test, but a down the gullet of someone who was pessimistic at best of ever finding a beer that I liked the taste of and/or a beer I would actually recommend to anyone. The winner of the harsh one man panel is what the waiter said was a Belgian beer, with the unlikely name of BLUE MOON. I bought a small glass of the product for obvious reasons. It was presented to me in a fat pilsner glass with a slice of orange attached to the side of the glass. The liquid itself was a medium brown with orange overtones. Mine had very little head to it. It was already poured so maybe it disappeared before it made it to my table. I squeezed a little orange into the glass and took another slug. I liked it. Since I didn't intend to have another, I never do, I nursed it throughout my meal, and each time the thought ran through my head that I actually liked it. I read about it later on the computer and it said it is a wheat-based brew. Is this a newly discovered base for a beer? I can't answer that. I do know it said it was a Coors product. I know I will try it again whenever I find myself in proximity of a drinking establishment. I don't know what a recommendation from an almost non-drinker might mean, but it is good. A kind of anthem for those of us who through no fault of our own have entered that realm of....oh I forgot. God bless all the unbelievably brave men who had to endure this day 65 years ago and a curse on all wars. Newser) – The Obamas arrive in Paris tonight, but the president and the first lady have told the Sarkozys that they'll need a little time alone. Barack and Michelle declined a dinner invitation from the French president and wife Carla Bruni, even though they are staying at the American ambassador's residence—right next door to couple's Elysée apartment. Obama and Sarkozy will meet tomorrow for a D-Day remembrance ceremony on Omaha Beach in Normandy. 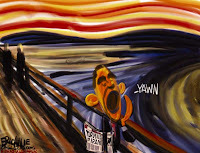 But as the Times of London points out, Obama grew irritated with Sarkozy during the G20 summit, when the French leader told colleagues he thought the president was inexperienced." 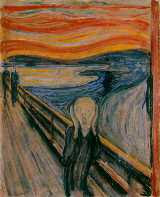 That led to an ice-cold Obama telling a French minister, "Please tell Nicolas that I shall do my homework." Good for Obama. Those French are so full of themselves beginning back with De gaulle. 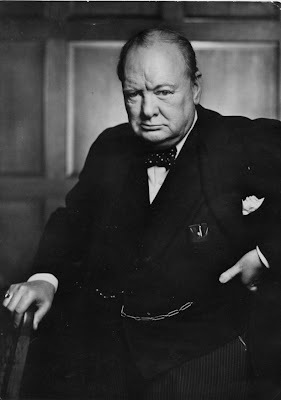 He though he won the second world war with a just a little help from Eisenhower and Montgomery. but none more important for you than the years just ahead. A time of testing and molding you into the man you will be. I wish you good choices. 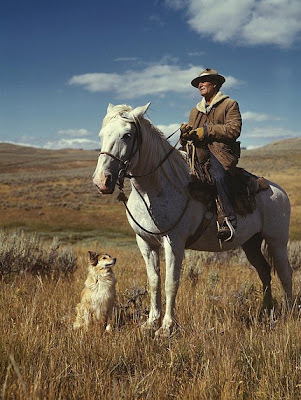 “Shepherd with his horse and dog on Gravelly Range, Madison County, Montana,” August, 1942. The library of congress owns millions of photographs taken through the years. This was taken in 1942, in color, a fairly rare process in those days. What strikes me is the testosterone quotient is overflowing. This could have been the first Marlboro man, it certainly tweaks all the masculine buttons. A love of the outdoors, man against nature, companionship of man and horse and/or dog in the open air. This could have been the inspiration of countless westerns/cowboy movies or just down the road a bit, television cowboys. Because he actually was a shepherd, the horse and dog would definitely have been partners in that business. A LITTLE INSIGHT AND PERHAPS A LITTLE EMPATHY ABOUT HOT FLASHES. In today's New York Times there is this article about a man who has prostate cancer and is being treated with a drug that suppresses testosterone. While on this drug he experiences hot flashes and other niceties claimed exclusively by the female world. The article is laced with humor about his trip into a mostly exclusive female world. because they are ignored.” Huxley is of course correct. But I can think of a hundred examples why ignoring the truth, when the future cannot be altered is of no value. MY AMERICAN TOWN HAS ONE FOOT IN A CAST AND THE OTHER IS ABOUT TO STEP ON THE BANANA PEEL. Can a town of 50,000 survive when it's industrial base is pulled out from under it bit by bit? This of course is a rhetorical question with an unknowable answer. The question has become a personal one. The town is mine and the latest loss is a big one and perhaps the final straw. Our town has been selected as one of the final pieces in the GM bankruptcy to have a redundant factory. It's been expected when word started filtering down that thirteen more plants would have to go. But it is no help for those employees affected; for the town, or it's businesses. and now GM 1200 workers. Could it have closed at a worse time? No, Will the town survive this? Yes they will, but what comes out on the other end will not be the same town. Out of necessity many will pull up roots and relocate because of job requirements. Some will relocate because the town itself is aging and because of the gradual loss of tax base is looking its age, and those who can afford to will decide that the grass is greener on down the road. What will also happen to a degree is the theory that a vacuum must by nature be occupied by something, will indeed be filled in by those who could not afford to escape to those greener pastures. As the tax base lowers, the infrastructure will suffer with neglected road repairs, boarded up houses will become more prevalent; house values already decreasing will decrease more. Livability decreases. What percentage of the population will stay? Who can say, but we know that the problem we already have, and that most smaller towns have alike is that all our best and brightest will leave because we do not now, and will certainly not in the near or far away future have the jobs to offer them. Who do we blame? No one in particular. The times certainly and who shares in that? The government for sure, The banks, indeed, Going to a world economy, which all economists swear by, but all towns like mine can only begrudge because it has taken our future away from us. Those of us who remain because of age and/or in truth because we don't have another move in us will remain in a town subtracted of many businesses whose presence and product made life a little more enjoyable for us. Such is the way of 21st century life, so far. Regarding your article about the closing of the GM plant in Mansfield, I found the information about other plant closures most interesting. 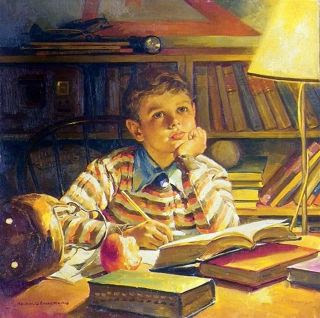 Until I read that I had forgotten how much a child of the industry world I was. To best describe this, I remember what my Grandmother Kitt said upon my marriage to Bill, a graduate engineer that was going to work at the Space Center in Florida. "Your man is so skinny, how will he ever work in a factory to make a living?" Of course, it was that wonderful industrial town of Mansfield that allow Grandma and Grandpa to achieve what they came to America to achieve. I am proud of my heritage and know I was taught good values that has sustained me all through life. America needs to build as that is what made America great and what is now dying. God help us all. It seems the older I get and the more I watch the politicians I find there is nothing new under the sun. Prejudice is prejudice, only the words, or codewords change. The wingnuts will just come at an issue from another angle. This cartoon by BORS seems to be right on, on that subject. Lindsay Graham of South Carolina on Fox News Sunday yesterday asked who was going to stand up for him, a white guy from South Carolina? Now what the hell does that mean? A little more of that coded stuff I think. The best moments on the Sunday talkshows. From the Daily Beast.